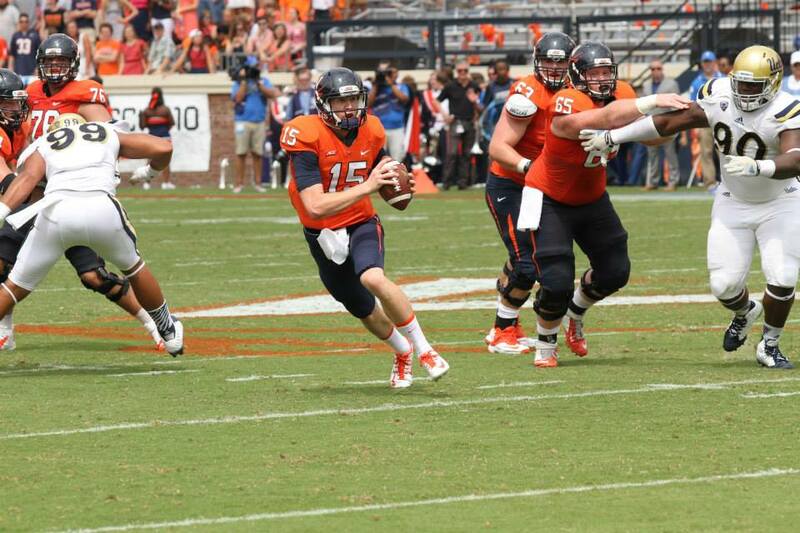 UVA football coach Mike London anointed redshirt sophomore Greyson Lambert a captain and then the starting quarterback after a solid spring. Matt Johns was listed third on the depth chart coming into the season opener Saturday against seventh-ranked UCLA. It was Johns to whom London turned when Lambert threw his second pick-six to give UCLA a 21-3 lead late in the second quarter, and Johns responded, leading Virginia on a quick scoring drive to cut the lead to 21-10 at the half, and then marched the Cavs on a pair of second-half scoring drives that kept the 21-point underdogs in the game until the final minutes. And now, yeah, we have ourselves another Virginia football quarterback controversy, though London wasn’t ready to concede that Saturday afternoon. “Like any other position, you have to perform. We’ll continue to evaluate players and look at the tape, and the players that can help us will play,” the coach said, belaboring the obvious, which is it wasn’t just that Johns, a sophomore, finished 13-of-22 for 154 yards and two touchdown passes, a pretty 29-yarder to Andre Levrone in the second quarter, an NFL-quality 23-yarder to Darius Jennings in the third, but it was how he did it. Johns looked comfortable from his first series in the game, setting up the Levrone TD pass with a 32-yarder to Canaan Severin on a third-and-long, while Lambert never did get comfortable, completing 16 of his 23 attempts, but for just 112 yards as he never could seem to get his eyes downfield, preferring to go to his quick reads. The two INTs came on bad misreads by Lambert, the first on a botched dumpoff aimed at Taquan Mizzell that was deflected as Lambert threw off his back foot, causing the ball to float high over Mizzell and into the hands of Ishmael Adams, who took the pick 20 yards to the end zone to get UCLA on the board. The second was far worse, and was easily a benching offense, with UVA facing a third-and-long late in the first half, down 14-3, after another UCLA defensive touchdown, on a return on a fumble by Kyle Dockins. The call was screen, and the play developed way, way too slowly, but Lambert still tried to put touch on his pass in the direction of tailback Khalek Shepherd, resulting in another floater that was picked off by Eric Kendricks and returned 37 yards for a third UCLA defensive score. It’s 21-3 at this point, and the rout seemed to be on. UCLA had come in as a 21-point favorite, still hadn’t got on track on offense, and Virginia had barely registered on offense on its side, getting just a field goal on Lambert’s eight drives. Enter Johns, who like almost everybody else in Scott Stadium was surprised to hear his name called. “I was a little surprised, but I couldn’t let my teammates see that, and I wasn’t going to let them see that,” said Johns, who estimated later that Lambert had gotten 90 percent of the snaps with the first unit in the week leading up to the opener. “When I was put in the game, I said, Guys we’re going to score this series and we’re going to win. I felt like that gave us a good opportunity,” Johns said. The quick five-play, 75-yard touchdown drive just before the half changed the complexion of the game from that point forward, and it’s not even arguable that Johns was the best of the three quarterbacks on the field Saturday, leading Virginia on three scoring drives in his seven drives leading the offense. UCLA quarterback Brett Hundley, who started the day on the short list of Heisman Trophy candidates, could manage just one scoring drive for his entire day, encompassing 16 drives. Even UCLA coach Jim Mora was singing Johns’ praises. Johns, good teammate that he is, and probably remembering that he came into the game listed at third on the depth chart at QB, didn’t use his newfound attention from the media to lobby for the start next week against Richmond. “No, that’s up to the coaches. They’ll decide that and we’ll leave it to them,” Johns said. That said, it seems obvious the direction that needs to be taken. Not that going with the obvious choice at quarterback has been a hallmark of the London era in Charlotteville.